A Hawaiian Legend. Written and illustrated by Helynn Hoffa. © 1981 by Helynn Hoffa. Published by Mosaic Press, Cincinnati, Ohio. Typeset in Italia Book. Hand-bound by Hugo Grummich at Cincinnati Bindery. 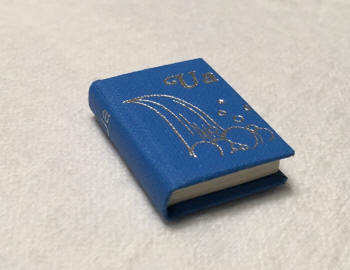 1" tall with 48 pages. Bound in blue bookcloth with silver stamping. $24.